Metro Vancouver issued a permit for Weir Canada Inc. to begin construction on a rubber-producing plant in South Surrey on Nov. 9, but local residents are uncomfortable with the manufacturing facility being in their neighborhood, according to an article by CBC. The rubber plant—which is situated in the Campbell Heights Business Park—will replace two other facilities, one in Richmond and one in Delta. It will produce rubber coatings made of pre-purchased rubber for pipes, valves, and pumps used in the mining sector and oil sands. Weir first submitted its proposal to run the plant in August 2016, but revised its application to reduce the level of emissions after public consultations. Initially, the plant’s emission level was supposed to be 42 tonnes per year, but Weir brought it down to 2.49 tonnes. Metro Vancouver’s environmental protection notice stated that contaminants such as nitrogen oxides, volatile organic compounds, and hazardous air pollutants would be released by the facility. Nearby residents don’t want the rubber plant to release any contaminants into the air because they feel that it will affect their health and the health of their families. It’s understandable to be concerned about the impact of air contaminants on oneself and the environment, but most people—including those who live in Surrey—contribute to global warming in their everyday lives anyhow. If they aren’t worried about living emissions-free, they shouldn’t be so concerned about the new rubber plant. Metro Vancouver Media Relations Manager Don Bradley also told the Surrey-Now Leader that the emissions produced by the plant contain fewer air contaminants than those emitted by a single wood-burning fireplace. The facility will operate within air quality objectives, as established by the city, and Metro Vancouver operates air quality monitoring stations across the region. There hasn’t been any clarity on what will be discharged from the plant, though. An environmental notice was sent out, but that won’t satisfy South Surrey residents unless physical measurements of what will be emitted are made available. They need more proof in order to support it. Worried residents need to realize that Campbell Heights has become one of Metro Vancouver’s most attractive industrial hubs because of its location and infrastructure. Those living in industrial areas should not be surprised if plant facilities show up near their homes. More companies are also moving to South Surrey, which means that more jobs are becoming available. According to The Canadian Press, Weir’s facility will create 30 new jobs, bringing the company’s total number of B.C. employees to 110. Everyone should see the rubber pant as an opportunity for job creation. There’s also been some growing concern about how Weir’s rubber plant will affect the Little Campbell River. Peace Arch News reported that close to 60 years have been spent restoring the river, and as a result, it is now the most productive salmon stream in Greater Vancouver. Some are afraid that the rubber plant will wreck the river again, and that’s a valid concern. Hopefully, Weir will be responsible enough to ensure that those fears do not become reality. 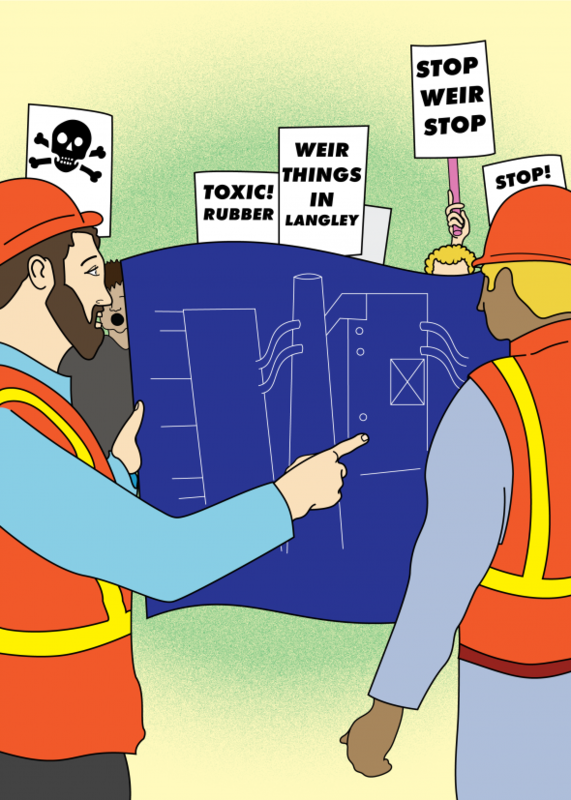 For now, South Surrey residents are going to have to accept Weir’s rubber plant into their neighbourhoods.